Australia will compete in the first semi final of the 2019 Eurovision Song Contest. 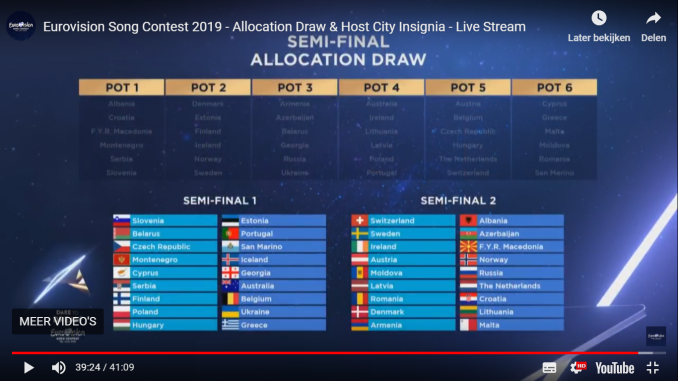 This has been decided at the allocation draw in Tel Aviv today. Australia’s artist will perform in the second half of the show. Australia will face the only other country with a 100% qualification record from semi finals: Ukraine. However, Australia avoided a showdown with Eurovision gigant Sweden. Sweden competes in semi final 2 against all the three countries who lost their 100% qualification record last year: Russia, Azerbaijan and Romania. ESCDaily will analyze the draw and come back to you with statistics and opinions later this week. Tonight, our chief editor Steef van Gorkum takes part in a Destination Eurovision panel discussion together with Polish Eurovision expert Maciej Mazanski. 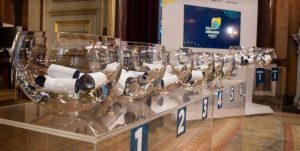 After determining which Semi-Final each of the six pre-qualified countries (France, Germany, Italy, Spain, the United Kingdom and host country Israel) will broadcast and vote in, it was time for the more competitive part of the draw. In which Semi-Final and in which half of the respective Semi-Final would Australia and the other 35 participating countries perform? The participating countries hade been allocated into six pots, based on historical voting patterns. Countries with similar tastes go in the same pot to avoid unbalanced semi finals.